I haven't written about my new restaurant finds in quite a while. It's not that I don't discover new places anymore, but I guess New York is not quite the brand new adventure playground that it used to be for me. I have lived here for two and a half years now and it is home so I don't feel the urge to try as many things as possible with the same sense of urgency as I did before. I have also very much come to terms with the fact that I am an Uptown girl and a lot of my regular eateries now are either on the Upper West Side (where I live) or in Tribeca (where I work). Both neighbourhoods are a little more "homely", less showy and trendy than Soho or the Meat Packing district, and therefore suit me far better. I'm a huge fan of sushi and cannot wait for my trip to Japan next month, where I hope to sample the best in the world at the Tsukiji fish market. In the mean time, Sushi of Gari, located near the National History Museum, will more than do. It is by far the most inventive and delicate sushi I have tried and considering that I have had the chance to dine at Nobu, it is no small feat. The decor itself is fairly non-descript and minimalist in a rather clinical way, but this is not your average corner sushi restaurant - the Okamase (which I heartily recommend) and a bottle of wine will easily set you back $150 per person. It is well worth the treat - the waitress will bring you each of the chef's specials of the day until you beg for mercy. With a bit of luck, they will include the simply amazing tuna nigiri with a dollop of creamy tofu puree and salmon nigiri with roasted tomato on top amongst many other delicacies. This is one of the places that Marie & I regularly frequent, especially if we are feeling lazy as it is only a couple of blocks away from our respective apartments. The Mermaid Inn is famous for its mainly French inspired cuisine and has a compact but fail safe menu of perennial seafood classics. The atmosphere is incredibly laid back yet refined, the service attentive but not pushy and the beautiful vintage maps adorning the exposed brick walls set your mind traveling to distant shores. 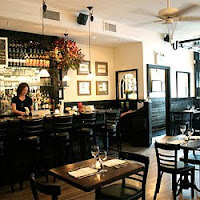 We both prefer to eat at the bar counter, perched up on the high stools and invariably order the same thing: a bottle of the delicious house Rose, half a dozen local oysters and the tasty pan-fried skate wing. I also love the complimentary cup of dark chocolate mousse they offer at the end of the meal. Hi Life is very much my go-to neighbourhood restaurant and bar. The food is good, plentiful and affordable and spans anything from American classics (burgers and fries) to sushi - while this is normally not a good sign, it works there as they execute every type of cuisine perfectly. The bar area has a speakeasy feel which is particularly cosy during the cold winters. In the summers, I like to sit outside and watch the world go by. It's quite a famous little institution here on the Upper West Side as the bar played a central role in an independent movie of the same name. I just like the fact that I can go there wearing yoga pants, a little white vest and not a scrap of make-up (like I did last Sunday) and not feel out of place or self-conscious. I have a sentimental attachment to this place as my friend Fionuala and I have made a habit of meeting there for tapas when we want to have a long, leisurely catch up. We always sit at the same table in the minuscule outdoor patio, set right on the street on a lovely corner of Tribeca. And we also always order the shrimp ceviche, ham croquettes and the pan-fried chorizo with plenty of bread to mop up the smoky juices, along with our favourite Chardonnay of course. My friend Kim introduced me to Ivy's a couple of months ago and I loved it straight away. This is my kind of place - small and intimate, with a tiny outdoor area and friendly service by what seems to be young wannabe actors (it reminds me of LA in that way). Their traditional Italian fare is hearty, generous and delicious. Many evenings have been spent there with a bunch friends since, sipping wine on balmy evenings while sharing their fantastic brushetta and antipasto or filling up on spicy sausage pasta. ooo... i am an tofu super fan! sigh. i want the spicy tofu sooooo badly right now. with rice.